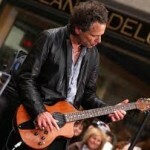 Iconic lead guitarist Lindsey Buckingham from Rock and Roll Hall of Famer Fleetwood Mac will headline a concert at the historic Fremont Theater in downtown San Luis Obispo on Tuesday, May 8 at 7 p.m.
Tickets go on sale this Saturday at 11 am at Vallitix.com, all Vallitix outlets and Boo Boo Records. Billed as an “Intimate Evening with Lindsey Buckingham,” expect the co-writer of several classic rock hits to play a mix of his solo and band material. This is the first rock concert to be staged at the Fremont in several years and is being presented by Numbskull Productions and SLO Brew. Several other music headliners are coming to San Luis Obispo County this spring including Dierks Bentley at the Pozo Saloon on April 14, X and Los Lobos at Blacklake Golf Course on May 6, Social Distortion at Pozo on May 20 and the Doobie Brothers on May 27 at Avila Beach Resort.